The mantra of polishing jewelry is the shinier the better – and obtaining polishing perfection takes skill and practice. It also helps to have the right tools in your polishing arsenal. The following are some suggestions for polishing tools and tricks you can use to obtain a better shine. When polishing, it’s important to remember that the abrasive compound does the work — not the polishing buff attached to the spindle of your polishing machine. The tool you choose to charge with abrasives merely offers different ways of pushing the compound onto the work. For example, I make discs from cardboard, stiff watercolor paper, leather, and even carpeting. These materials offer a range of surfaces on which to apply polishing compound for various applications. You can use watercolor paper to get in between prongs. A cardboard sanding disc offers flat lapping capabilities comparable to that achieved by a proper jeweler’s lap tool. You can even use CDs for general polishing applications if paper label stock is applied to both sides to reduce the threat of shrapnel if the plastic shatters. The advantage of using a flexible material for a disc is that as it spins, it trues itself from the centrifugal force and does not bounce and judder as a stiff material such as hardboard (“masonite”) would. However, discs made of flexible materials such as cardboard, paper, and leather may need their centers stiffened to prevent them from wearing out on the threaded tapered arbor of the polishing machine. My usual approach is to cut a 2-inch diameter disc of cloth (T-shirt material is best) and epoxy the disc onto the center of the cardboard or paper. When the material hardens, it stiffens and supports the tool. A satin finishing tool can be found in buildings that use large floor buffing and polishing machines. These machines use large (sometimes up to 3 feet in diameter) Scotch-Brite-type pads. To mount the pads, the maintenance staff knocks out a perfect 4 to 5 inch diameter piece from the center (above, left) and promptly throws it in the garbage. Make friends with the maintenance staff and ask for these. With a little bit of epoxy or hot glue to stiffen up the middle and allow them to be mounted onto a polishing spindle, these circular pads are similar to the satin finishing tools that jewelry suppliers sell for $8. Also, ask the maintenance staff for the large pads when they think they’re used up. You can cut these up, toss them in the washing machine or dishwasher for cleaning, and use them as abrasive pads. The most useful tools in the industry for the first stages of polishing are wood hub natural bristle brushes (above). Using a bristle brush and Tripoli or similar compound, you can strip the firescale off any silver object in less than 10 minutes, or prepare gold jewelry for further polishing just as quickly. Feel free to use a lot of compound; it will work faster if you do. Able to hold polishing compounds well, natural bristle brushes are the only tools that can get into hard-to-reach areas, such as inside right angles and around prongs. After polishing, follow up with buffs of various shapes and stiffnesses. The crisper and more geometric the surface being polished, the harder the buff should be. 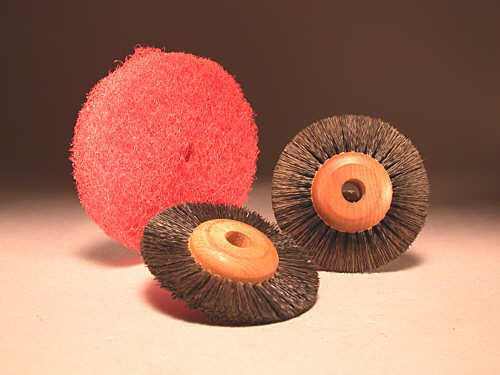 The new 3M radial bristle discs work in a similar manner as the wood hub bristle brushes. They can be used for pre-polishing or abrasive work. One trick worth noting is to buy a larger diameter threaded tapered arbor or spindle for your polishing machine to replace the one it came with. Commercial polishing machines for jewelers come with only a 0.5 inch diameter spindle, which forces jewelers to buy expensive jewelers’ buffs that have a small center hole. By switching to a larger diameter spindle (1 or 1.5 inch diameter), you can use cheaper hardware store buffs for some work, and increase the range of tools you can thread onto the machine. The award-winning Journal is published monthly by MJSA, the trade association for professional jewelry makers, designers, and related suppliers. It offers design ideas, fabrication and production techniques, bench tips, business and marketing insights, and trend and technology updates—the information crucial for business success. "More than other publications, MJSA Journal is oriented toward people like me: those trying to earn a living by designing and making jewelry," says Jim Binnion of James Binnion Metal Arts. Click here to get a FREE four-month trial subscription.